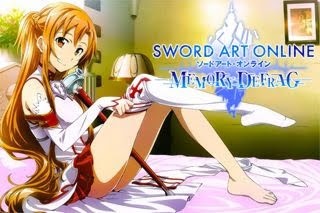 Forging Weapons and Armors is a very good way to get quick Defense, Attack and Magical Attack bonuses. If you want to boost your character's level, this method will greatly help you defeat monsters faster, and reduce damage intake. To effectively use this method, learn how to get the materials needed and how to upgrade your items up to the safest level. Refer below to learn more. - Item +5 going +6 attempt = Item Breaks! - Item +6 going +7 attempt = Item Breaks! - Item +7 going +8 attempt = Item Breaks! - Item +8 going +9 attempt = Item Breaks! - Item +9 going +10 attempt = Item Breaks! still degrade the item's upgrade Lvl by 1 though. Refer to the Sup, Forging Tool below for more info. - For Grade 1 (white) weapons. - Get from Consumable Merchants, Lucky Box, Shining Blue Box, and monsters. - For Grade 2 (green) weapons. - For Grade 3 (yellow) and 4 (purple) weapons. 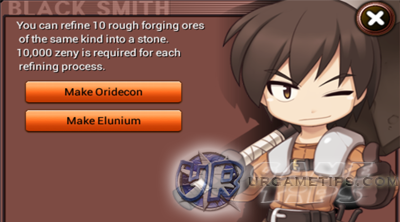 - You can refine 10 Rough Oridecons into Pure Oridecon through the Blacksmith. - Increases your success chance of forging weapons. - Used together with your Oridecons! - Available from the Cash Shop. - An ore that is used to forge Armor. - You can refine 10 Rough Eluniums into Pure Elunium through the Blacksmith. - Increases your success chance of forging armor. - Used together with your Eluniums! - Used for forging Equipment items to safeguard against the items' destruction. 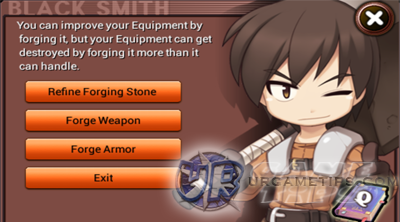 - Select the "Precision Forging" option to use item. Check Valder Blacksmiths. - You can get 1 free from Valder quests too. Save it for later use! - Shining Blue Box = Pass the Gates of Trials, "Prison of Trials" Lan Forta NPC. or any similar option in case your item breaks due to in-game bugs!. If it did, take a screenshot again right after the "FAILED" prompt!.